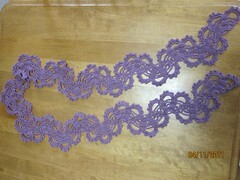 Filigree Scarf Finished, a photo by Pointe Shoes Punk Rock And Purl Pix on Flickr.Done! Is finished and currently on the blocking foam. Great pattern and the Blue Skies Alpaca silk is addictive!